Hello friends we know very well that at present time billion of users have to use WhatsApp facility in his Smartphone. There are lot of tips and tricks which you use in your Smartphone which helps you very much but due to the absence of knowledge most the person don’t use these tips and tricks. This article will helps you to Stop Auto Download and Save photos, Videos on WhatsApp messenger on your smartphone. Do you know that during running the WhatsApp messenger on your smartphone by default WhatsApp auto download and save photos, videos on your smartphone device on which you are running the WhatsApp messenger and your smartphone image gallery is fulfill with all kind of downloads. It not only occupied lot of space on your memory but also unwanted images, audio and videos are also automatically downloaded and and taking lot of space in your smartphone memory area. Most of person want to know how to disable or stop auto download and save photos, videos on the WhatsApp messenger now, after reading this article you will be able to easily disable or stop WhatsApp auto image, audio or video download feature in your smartphone. This trick also helpful for those person who don’t want to download images or videos in his mobile memory due to many reasons. There are lot of many reasons due to which most of the persons don’t like this feature and want to disable auto image download in his smartphone like this feature not only occupied lot of space in your smartphone but also reduce the mobile battery and internet data pack from your smartphone. So, if you want to save your mobile battery, save remaining internet pack or space on your smartphone then you must have to disable or turn off this feature immediately from your smartphone. Step 1: If WhatsApp is not running in your smartphone at present time then first you have to turn on WhatsApp messenger on your smartphone. Step 2: Tap on the three dotted button which is located on the top right corner to open the different option > Tap on the “Settings” option > This will show different options in the “Settings” window. Step 3: Tap on the “Chat Settings” option, again you will get different option > Now, tap on the “Media auto-download” option> it will show three different options like “When using mobile data”, “When connected on Wi-Fi” and “When roaming” in the “Media auto-download” window. If you want to immediately disable WhatsApp auto download feature for all images, audio or videos messages then you must have to choose “No media” option by turn off all check marks from the Images, Audio and Video option as per your need from the given all three option. Images: If you want to disable auto download only for images on the WhatsApp messanger then turn off this option as per your need. Audio: If you want to disable auto download only for audio messages on WhatsApp messanger then turn off this option as per your need. 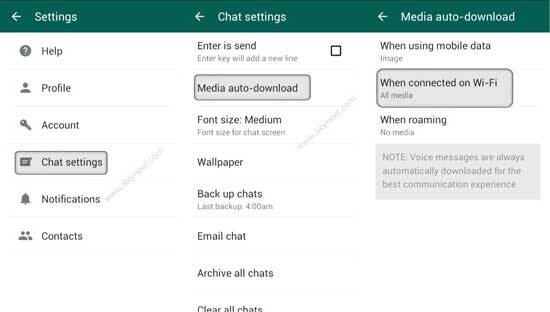 Video: If you want to disable auto download only for video messages on WhatsAPp messanger then turn off this option as per your need. I hope you like this stop auto download and save photos, videos on WhatsApp guide. After reading this article you will save your battery life, save internect data pack and also save storage space on your smartphone. Kindly share your knowledge with your friends, family members and others and also write your important suggestions in the comment box regarding this article. Thanks to all.